DENVER, May 31, 2002 - Movies often push the truth when depicting scenes of advanced technology. However, The Sum of All Fears, which opened May 31, is the first film to use and properly portray high-resolution satellite imagery that has only recently been available outside of the intelligence community. Denver-based Space Imaging supplied satellite images, worth approximately $90,000, to Los Angeles visual effects shop Rhythm & Hues Studios for its work on scenes in the Paramount Pictures film based on the Tom Clancy book. The images are used as transitional elements in the movie, presenting incredibly realistic zoom-in scenes of seven locations around the globe: the Federal Emergency and Management Agency (FEMA) headquarters (Mt. Weather, Va.); CIA headquarters (Langley, Va.); Baltimore; Damascus, Syria; Vienna, Austria; Haifa, Israel; and Sarova, Russia. 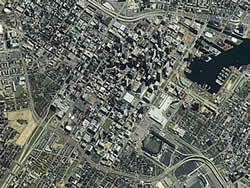 Space Imaging supplied satellite images similar to this one of Baltimore, Maryland to Los Angeles visual effects shop Rhythm & Hues Studios for its work on scenes in the Paramount Pictures film based on the Tom Clancy book. "Hollywood has always been enamored with satellite imagery, but few films outside of The Sum of All Fears have depicted high-resolution images and capabilities in a realistic manner," said Mark Brender, Space Imaging's executive director of Government Affairs and Corporate Communications. "Tom Clancy is known for his painstaking research and realism. This movie is the first to use real satellite imagery in a major way." IKONOS is the world's first commercial high-resolution imaging satellite. It is capable of providing one-meter resolution images of virtually any place on Earth. One-meter resolution means that objects as small as one meter squared on the ground can be recognized. Although IKONOS can't distinguish objects as small as individual people, it can show individual cars from its orbit 423 miles in space. "Movie director Phil Alden Robinson wanted to use transitional elements in The Sum of All Fears to help orient the audience to various locations," said Thomas Moore, pipeline setup technical director at Rhythm & Hues. "To achieve this, we used high-resolution satellite imagery in such a way that the imagery doesn't stand out," Moore said. "We didn't want the elements to be too flashy, as had been done in other films. We wanted the elements to look like realistic satellite images." For example, the director wanted the Baltimore shot to include the harbor at night. Since it is rare to find high-resolution satellite images taken at night, the Rhythm & Hues staff altered an IKONOS image to look as if it had been taken at night. Because the field of view needed to include the harbor and city, Moore noted, four images were used, scaled down and pieced together to create a full city image. To make the image less static, Rhythm & Hues created the image to be too large to project so that it could be panned slightly. A combination of digital painting and numerous reference photographs were used to painstakingly recreate the city of Baltimore at night. 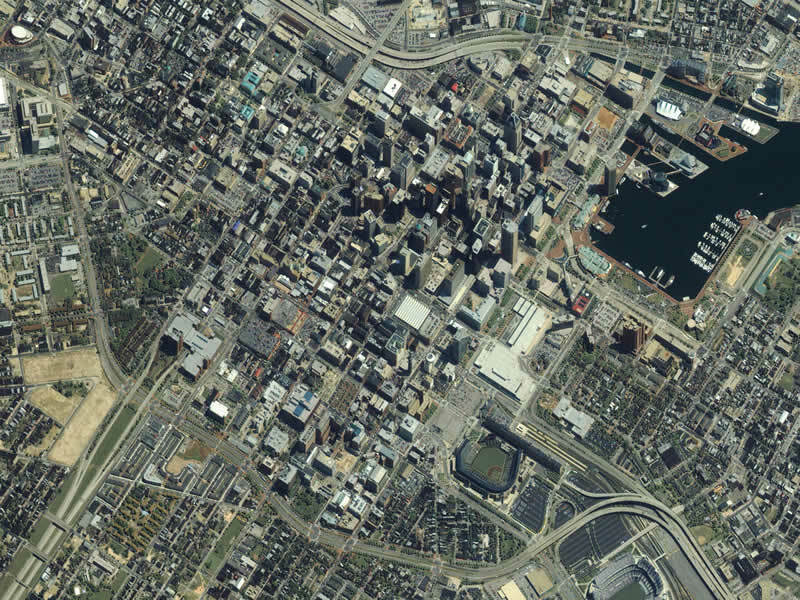 High-resolution satellite imagery will continue to be used in films, Moore predicts. "With this type of data commercially available and half-meter imagery soon available, Hollywood can create realistic satellite images, providing audiences with a new level of detail, accuracy and entertainment," he said. Rhythm & Hues Studios is an Academy Award-winning film production studio specializing in visual effects for feature films, television commercials, theme park rides, music videos and interactive games. Its staff of more than 300 includes live-action and animation directors, animators, painters, modelers, producers, programmers, writers, and technical and production personnel. The studio won the Best Visual Effects Academy Award for its work on Babe. More information can be found at www.rhythm.com. Space Imaging is a leading supplier of visual information products and services derived from space imagery and aerial photography. The company launched the world's first one-meter resolution, commercial Earth imaging satellite, IKONOS, on Sept. 24, 1999. Other products are produced from the Indian Remote Sensing satellites, U.S. Landsat, and Canada's RADARSAT. Space Imaging also delivers aerial-derived imagery products collected by its own Digital Airborne Imaging System (DAIS-1(tm)). For detailed information about Space Imaging, visit its Web site at www.spaceimaging.com.